Connects to iPods and Portable Music Players! Customers love our wireless frog speakers! 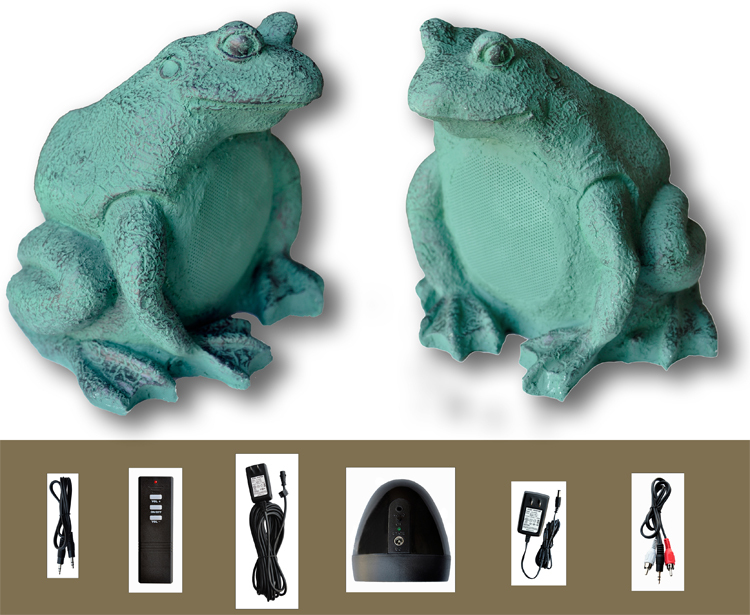 These all-weather wireless frogs sound great and use the 2.4GHz digital transmission for cleaner and less distorted sound up to 300 feet (distance varies depending on the environment). Typical locations for these wireless frog speakers include yards, ponds, bordering a garden and even as an accent in flower gardens. All OSD Auio wireless speakers include portable player connectivity. Simply plug your music source (iPod, MP3 player, computer, etc) into the wireless transmitter (RCA and mini audio cables included), run the speakers where you want them and you'll be listening to your favorite tunes in the back yard or patio. 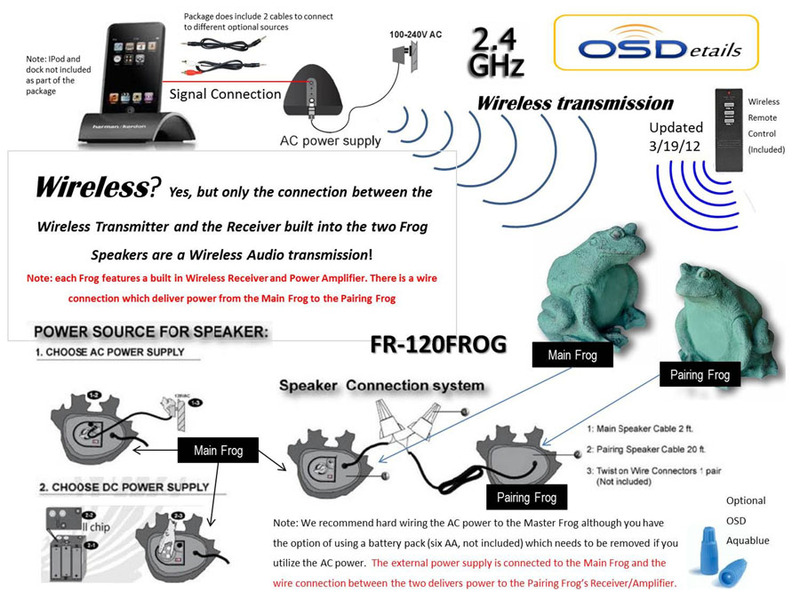 How durable are your Outdoor Wireless Frog Speakers? These speakers are designed for the outdoors. Our frog speakers use non-water-absorbing materials, which is critical in winter so they won't freeze and crack. The shape is designed to withstand large amounts of pressure, extreme temperatures and moisture. Remember though, outdoor speakers are an investment, so take care of them. Storing your frogs away from extreme weather conditions will only lengthen the time you will have with them. 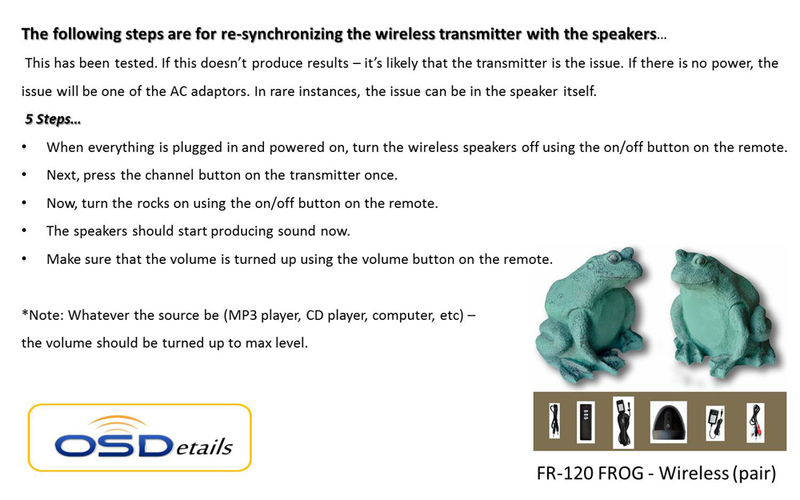 Even if you have no experience installing audio equipment, our wireless frog speakers are easy to set up. The system uses a main speaker that includes an amplifier for power. The second speaker is a pairing speaker, meaning it draws power from the main speaker. Connect the audio source (iPod, receiver, etc) to the transmitter via the provided audio cable. Plug the transmitter into an AC outlet via the included AC power supply. Plug the main speaker to an outdoor junction box or load the main speaker with 6 AA batteries (not included). Place your frog speakers where you want them. You may have to experiment with frequency channels and speaker placement to achieve the best sound. Press the transmitter button then the on/off button on the remote several times until you find the right frequency. Please Note: The 2 speakers are connected via 30ft speaker wire. 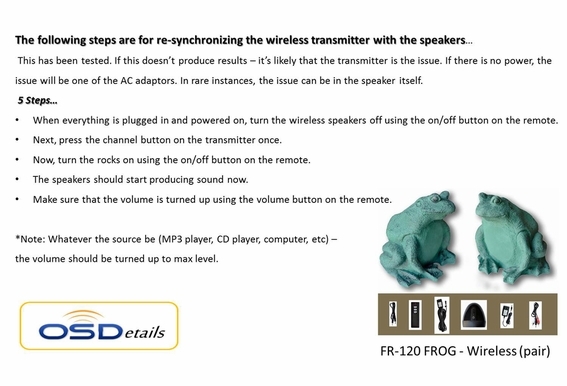 Wireless refers to the fact that you do not need to connect the frog speakers to your audio source. The two speakers are connected via speaker wire because an amplifier is built into the main speaker which acts as the power source for both speakers. This is why the rock speakers must be wired together. Included AC Power 120V Power supply. 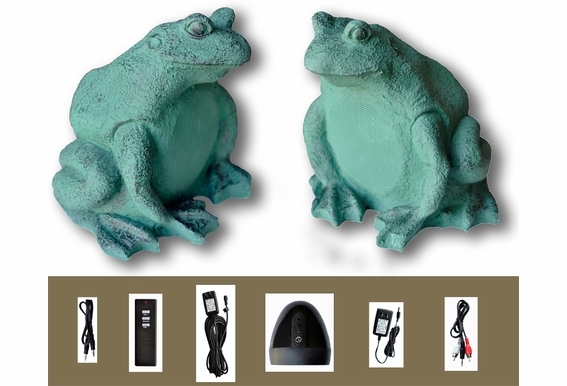 Dimensions: H 10.5" x W 11.4" x L 19.6"
Now you can have a pair of frog speakers in your backyard without running wires from your house, this pair of frog speakers come with everything you need for your a wireless hook up. Can I use these speakers with my WR800 Rock Speakers off the same transmitter? Can I purchase a new transmitter? The one i had was destroyed by my dog . I would like to buy these speakers,but would like to only use the speaker wire directly from my srereo. Without plugging them into an electrical outlet. Is this possable? I'm surprised this question wasn't bought up before. Can I connect the frog speakers to a samsung sound bar that has blue tooth capabilities? My Frog speakers do not play music. Both green lights are on (both the main Frog and the wireless dock) and no matter how many channels i flip through no music comes out. What is the problem? Do the frogs or rock speakers need to be connected? meaning can I have one frong in the back yard and one in the front yard? My transmitter for my frogs has died. I no longer get a green light when plugging it in. Is there replacement available or another transmitter that will work with them? I live in Phoenix will they be able to handle the extremely hot summers? 1) Do all OSD-made speakers use the same transmitter? For example, could i connect the two frog speakers (for outdoor use) and connect four normal speakers (for indoor use) to play at the same time? 2) I have a BLUETOOTH receiver that is connected to my stereo to play music throughout the house (I have bose speakers). 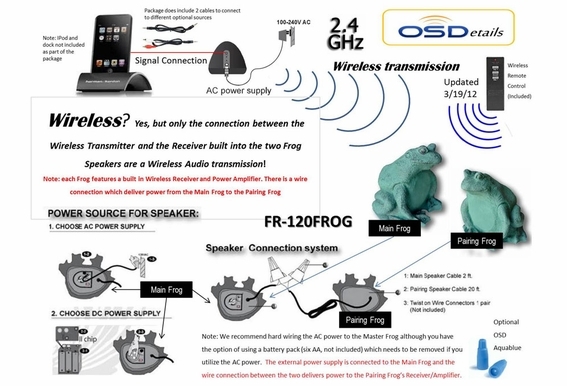 If I was to buy the two frog speakers, would I be able to somehow connect the transmitter to play both the frog speakers and the speakers i already have in the house? In addition, I use an iPad to connect to the stereo in order to play music (that's why I have the bluetooth receiver). Thanks. Can these run off of a stereo radio? What happens if I lose the remote control? Can I buy another remote that is compatible with the Wireless Frog Speakers? Can the TV that has Sirius be hooked to these? Can I add 2 regular frog speakers (wired) to the wireless pair I've bought? any experience with how much listening time you get out of the six batteries? where do you hook it up to the reciever? Hi Seleste: You have a couple of options for connecting these Wireless Frog speakers. Connecting your source to the Transmitter is the key. There is a 3.5mm to dual male RCA cable supplied in order for you to connect to a Receiver. You need to check your Receiver's owners manual to see if you have a pre- amp audio output to connect to the Wireless Transmitter supplied with the system. The cable connects the two RCA to the output of the receiver and the 3.5mm plugs into the Transmitter. A second cable supplied is a 3.5mm to a 3.5mm aux cable that is used to connect directly to an iPod or other mobile device that features a headphone jack. So basically to answer your question you need to see if your Receiver has the proper pre-amp output if you want to use it for the main source. Note, each Frog speaker has its own built in amplifier so the signal can not be amplified already. We refer to the signal as pre amplified or signal level as it comes before the Amplifier. Do I need 2 pair and 2 transmitters for a left and right channel for stereo or does 1 pair handle that? I just received the 2.4GHz Wireless Outdoor Frog Speaker Pair and they are great but the volume seems to be lower than it should be. I have it turned up all the way but it still seems fairly low. Right now I have them inside until I put them out at the pool in the Spring, will they sound louder outside than they do inside? why do you have to connect the speaker by wire? how do they handle the weather? Dan, OSD outdoor speakers are constructed with high-grade material that can withstand rain, snow, wind, pool chemicals, even salt. For customers in freezing cold temperatures, we do recommend they bring in the speakers in or cover them with plastic bags just to be safe. Being that you are in Califonia, these speakers can definitely handle being left outside year round. Can I use the frog speaker pair and the rock speaker pair on the same transmitter? We would like to have a total of 6 speakers in our back yard.....3 on the west side, 1 on the south side and 2 on the east side of our yard. Can they all be hooked up together and be controlled by one transmitter or are each pair controlled separately? Yes, you can connect multiple pairs of speakers. We have had customers connect up to four pairs off a single transmitter. (For your six speakers, you will end up with two spare transmitters.) Note you will have three pairs that will each have master (with the receiver built in) and a satellite speaker which will be hard wired to the master of the pair.